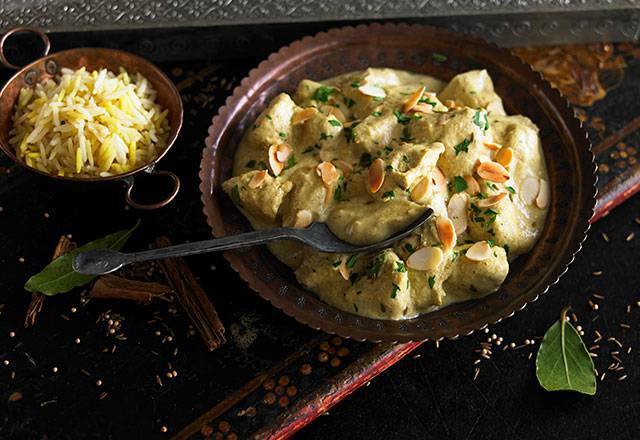 Tender marinated chicken in our mild, creamy coconut korma sauce, delicately spiced and served with pilau rice. Remove the film but leave the korma and rice in their wooden trays*. Place both trays on a baking tray in the centre of the oven and cook for 30 minutes. If using a gas oven, cook for an extra 5 minutes. Water, chicken (19%), coconut cream (coconut, water), rice (14%), onions, Greek style yogurt (milk), butter (milk), Flaked almonds (nuts), lemon juice, ginger purée, sugar, salt, rapeseed oil, garlic purée, fresh parsley, cornflour, ground cumin, ground coriander, ground cardamom, turmeric, white pepper, Yellow mustard seeds, ground fenugreek, mustard powder, cumin seeds, ground ginger, ground cinnamon, cardamom seeds, bay leaves, ground black pepper, ground dill, chilli powder, coriander seeds, ground mace, ground cloves, ground bay leaves. For allergens, see ingredients in bold. May also contain nuts, peanuts and sesame. Beat the eggs in a bowl and add the onion rings, mixing well. Throw in the flour, coriander and cumin, and stir well. Heat the oil in a pan and fry over a medium heat. Add a large spoonful of mixture to the pan and cook for 30-40 seconds until golden brown, turn over and fry for another 30 seconds. Repeat with the remaining mixture. A mild, fragrant curry like this one needs to be treated to a light and fruity wine to prevent it from being overpowered. We think a chilled bottle of Viognier is just the thing. Be wary of reds, as most will overpower this dish.